Arizona Scenic Byway-67 passes through the forested lands of the Kaibab National Forest and Jacob Lake and then continues to the North Rim of the Grand Canyon in northern Arizona. The closest town is Fredonia, Arizona which lies on the border of Utah. The forested lands of along the byway are majestic as they lead to the park entrance. The entrance is 85 miles from Mount Carmel Junction in Utah, and then it's another ten miles to the Grand Canyon Visitor Center. ASR-67 often closes after the first heavy snow and does not open again until mid-May. Check to see if roads are open from mid-October to mid-May when services close down at the North Rim. The Grand Canyon Lodge and Grand Canyon Visitor Center close mid-October each year (but there have been exceptions! ), but the North Rim itself and the trails remain open. Note that the North Rim is a primitive area with few services. If visiting the Grand Canyon North Rim after the lodge closes, be prepared for no services after Jacob Lake. The North Rim is open to winter backcountry use. Permits are required for overnight camping. ADOT determines the closure of SR-67 and not the National Park Service. The South rim of the Grand Canyon does stay open year-round. Zion National Park in Mt. Carmel Jct. and continues to Arizona 89A. Utah State Road 14 is Cedar Mountain. Forest Service Roads - Kaibab forest offers great, unpopulated summer drives, through ponderosa pine and aspen forests to vistas of the North Rim of the Grand Canyon that are just as good or better an anything seen from any rim of the canyon. Many feel that the best views of the Grand Canyon are from Crazy Jug Point and Timp Point. Crazy Jug Point is near Monument Point which is a popular trailhead for Thunder River and Deer Creek. If lucky enough to visit the North Rim of the Grand Canyon in October, try the forest service road to Timp Point which is the better view point of the two. This path traverses rows of aspen, and in October it's stunning with fall colors. Bring binoculars to get a great view of Thunder River flowing from Tapeats Canyon. Dispersed Camping in the Kaibab Forest Dispersed camping is permitted in the Kaibab National Forest as long as it is outside the Grand Canyon National Park boundaries. Please, leave no trace of your stay, and pack out what you pack in. Always camp away from water and roads. Directions to North Rim Grand Canyon: From Zion National Park, take on U-9 through the park to Mt. Carmel Jct. Turn south on US-89 to Kanab. There is only one stop light in Kanab; this is where US-89 changes to ALT 89. Fredonia, Arizona is 6 miles. In Fredonia take 89A to Jacob lake (36 miles), then take AZ 67 to the Grand Canyon North Rim park entrance. This is the area where hikers cross the Colorado River when hiking from the South Rim to the North Rim. Jacob Lake - Services often remain open at Jacob Lake after the North Rim Grand Canyon Lodge closes in mid-October. Don't bring your boat to Jacob Lake looking to launch it. Jacob Lake is a small pond on private property. Kaibab Plateau Visitor Center - The Kaibab Plateau Visitor Center usually remains open after the Grand Canyon North Rim services shut down for the winter. The Kaibab Visitor Center closure date varies. The Visitor Center for the Kaibab National Forest, is located at Jacob Lake, where highways 67 and 89A intersect. Children will enjoy the kids program. Filling out a worksheet about the displays inside the center rewards the kids with knowledge of the area along with a prize and badge. 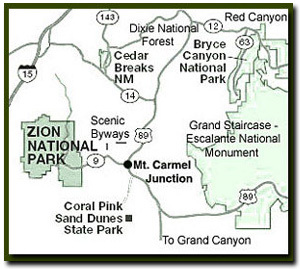 Directions to the Grand Canyon North Rim - From Zion National Park, travel Highway 9 to Mt. Carmel Jct., then turn south on Highway 89 to Kanab. There is only one stop light in Kanab; this is where Hwy 89 changes to Highway 89A. Fredonia, Arizona is just a few miles away, across the Utah - Arizona border. Take Highway 89A to Jacob lake (36 miles), then take Highway 67 to the Grand Canyon North Rim park entrance. North Rim Grand Canyon Location - The North Rim of the Grand Canyon is 85 miles from Mount Carmel Junction, which is located on the east side of Zion National Park. Many who visit the National Parks of Southern Utah add the North Rim of the Grand Canyon to their travel plans and those visiting the North Rim of the Grand Canyon often visit Zion National Park. Consider buying the America the Beautiful Park pass. It will get you into Cedar Breaks, Bryce Canyon National Park, Zion National Park, Grand Canyon National Park and all the US Federal Lands on your want to see list. The pass can be purchased online or at the gate of any of the parks. Help out your favorite park and buy the pass from them or speed up the lines to get into the parks and get yours ahead of time on the internet.